We know how tempting “just a few more minutes” can be. 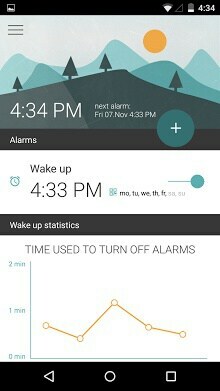 That’s why we made an app that makes it hard to be a snoozer. The sweet material inspired design and playful transitions engage and delight, and with the various options to create wakeup sequences you can make a morning routine to get you up and get your day started right. 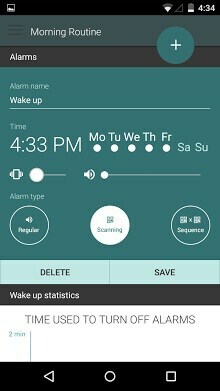 You can set an alarm to require a barcode scan to turn off, or just the classic press of a button, then add a step for the alarm to open an app or website to ease you into the day with music or news. If you’re feeling more advanced, you can make a sequence, where each step can have its own turn-off requirement which puts the alarm in snooze for as long as you’ve defined before the next step. Each step can start an app or webpage if you wish, or for those who go the extra mile with their tech, we have Tasker support, which really opens up what’s possible. There are other smart features, like wifi-locking a sequence so you can stay the night away from home even if you didn’t bring the barcode you usually scan, and muting the alarm while you’re in motion so you don’t wake the house on your way to that coffee. So give it a go and leave those snoozing days behind! *shampoo bottle and wifi-connected wall socket not included but available from third party companies. We use this to show a list of your bookmarks to choose from when you set up post-alarm actions. We use device location to find the nearest available weather info station. We use this to let you select sound files from your storage to set as custom alarm sound. We use the camera for scanning alarms. We don’t use the microphone, the permissions are just bundled. We use this for the wifi lock feature. To collect information about your device for crashlogs and statistics. NOT PERSONALLY IDENTIFIABLE. There is unfortunately no permission which allows us to collect the impersonal info that aids us in squashing bugs and improving the app without also acquiring the permission to read the full phone state. To be clear: WE DON’T USE OR COLLECT CALL INFORMATION, but access to it comes bundled with the access we need. We use this so you don’t have to get past the screen lock before you can turn off the alarm. When the device restarts, we need to re-register the alarms. We use this for the Flic integration. We use this for vibrating alarms. Because it would be silly if the app went to sleep while trying to stop you from doing so.